Pandit Shri Satyanarayana Sastry ji is the founder, mentor, advisor and chief priest at Sri Lakshmi Ganapathi Temple and Hindu Cultural Center of Ohio. Pandit Shri Satyanarayana Sastry ji hails from Bangalore, Karnataka, India. Honored with PRAYOGA RATHNA award by Sri Jaya Chamaraja Sanskruta Maha Patasala, Maharaja of Mysore, India (1974). Honored with AGAMA VIDWAN award from Agama Maha Sabha, Bangalore. He is a Rig Veda Pandit. Holds diploma in Poorva Prayoga, awarded by the Karnataka Government. Bachelors Degree in Commerce from Mysore University, Karnataka, India. Pandit Shri Satyanarayana Sastry ji has served many Indo-American communities in the states of Georgia, Arizona, California, Utah, Tennessee, Kentucky, West Virginia, New York and Ohio, and has worked as a priest for over 40 years. Sastriji is fluent in Telugu, Kannada, Tamil, Hindi and English and is knowledgeable in all South and North Indian religious rituals. Rigveda and Krishna Yajurveda Pandit & Proficient in Karmakanda. Performs Yantra Sthapana for businesses, marriages, children, health, etc. Specialized skills in ALL HAVANS(YAGNAS) and shodasha karma kanda (such as Jaatakarma, Naamakarna, Annaprashana, Choula (Mundan), Aksharabhyasam, Upanayanam, Wedding in South and North Indian and Gujarati tradition, Seemantham (baby shower) and all Pratishtapanam and Kalyana Utsavam of all deities, (both Vaishnava and Shaiva tradition) mass and individual Satyanarayana Puja (able to say kathas in several languages) and Gruhapravesham and good knowledge in Jyotishya Sastra, Anthyesty Karma (Last Rights), etc.). Organized and performed five Murthy (Deity) installations in BHTemple (such as Venkateswara, Shiva Parivara, Ayyappa, Durga, Gayathri, & Sarasvathi) in three years. Raised funds of over $500,000 during these installations. 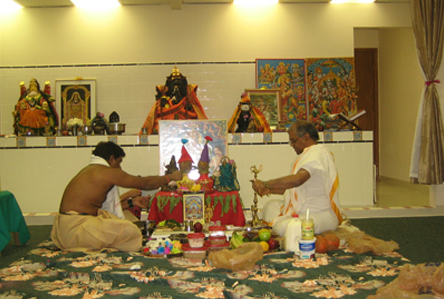 Organized and performed prana pratishta (Murthy installation) at Bharatiya Ekta Mandir of Arizona, Phoenix, Arizona. 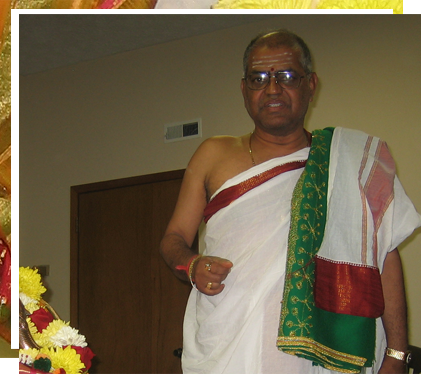 Organized and performed the prana pratishta of Satyanarayana Swamy Devasthanam in Silicon Valley, Fremont, CA. Proficient in English, Sanskrit, Kannada, Hindi, Tamil, Telugu. Good experience in lecturing on Hindu culture to the students and organizing Bhajans. Gave several lectures at the prestigious and respected organization such as Sri Vivekananda Seva Trust, Bangalore, India. Attended Millennium Peace Foundation Conference in South Korea for five days in the year 2000, and gave a speech on Hindu wedding.